There are a number of certainties pertaining to the winter months in northeastern Ontario. One is that towns such as Sault Ste. Marie, Blind River, Espanola, Sudbury, North Bay, Timmins, Iroquois Falls, Kirkland Lake, Cochrane and Hearst will get their share of snow. Not all the games are played on the ice of the indoor arenas of the northern towns. To be sure, some of the games are still played outside — and not just on city or town operated rinks. 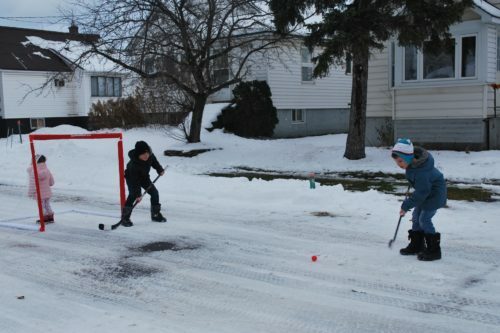 Yes, some of the kids of the north still organize and take to playing hockey in their driveways, on the streets and roads and in parking lots or school yards. Which, just may be hockey in its purest and most innocent form. Whichever northeastern Ontario town it may be, chances are there is a hockey game going on somewhere. Which, during the cold, snowy winter months, can serve to warm the hearts of so many. Is it any wonder that hockey is known as Canada’s great game? See them at the indoor rinks. See them playing on the driveways and streets in Canadiens and Maple Leafs toques, winter jackets and pants and good, old winter boots. However, we did enjoy one privilege – our dad and a neighbour flooded a flat vacant lot to provide our own ‘private’ skating rink. The problem was, the natural ice season was pretty darn short, hence a lengthy road hockey season. Those were grand old days, b’gosh. Cheers!